Abiy Solomon (b.1983), is a photographer and one of the most prominent graphic designers in Addis Ababa. 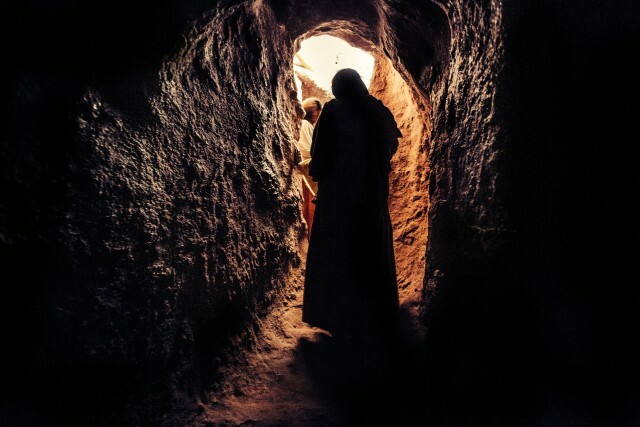 In his photography series, Primordial Modernity: The Raw Spirit of Lalibela, he offers a meditation on spirituality and the profound interiority of faith, as he photographs monks in Lalibela exiting and entering the hushed, dark spaces within the ancient rock-hewn churches. Offset by the bright sunlight that pours in through the open windows and doorways, the images are imbued with a reverent feeling: a contemplation of light and darkness, as well as the inner and outer manifestations of religiosity. Solomon, holds a degree in Animation and Visual Effects from Maac University in India (2008). He is the founder and Creative Director at Orangeswitch, a design company, and Partner at Africology Media.